Give a stunning gift, with these beautifully crafted sterling silver and 9ct rose gold Tree of Life Heart pendant. A shimmering pearl sits in an intricate sterling silver and 9ct rose gold setting. All Clogau Welsh jewellery contains a touch of gold mined from the Clogau St David's gold mine - the very same gold used in generations of royal jewellery. 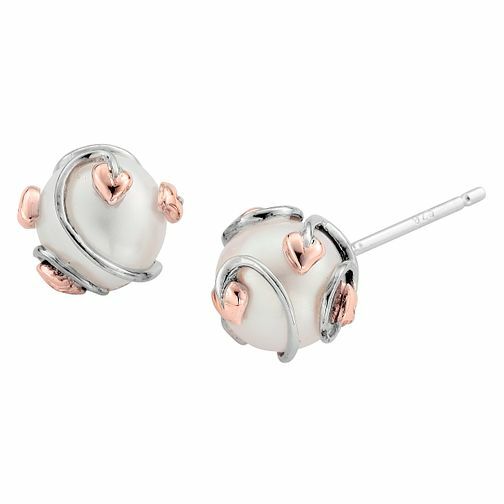 Clogau Silver 9ct Rose Gold Tree of Life Pearl Stud is rated 5.0 out of 5 by 1. Rated 5 out of 5 by Anonymous from Beautiful! Really pleased with these earrings. But sssshhhh... they're for my daughter for Christmas and I'm sure she'll be delighted!